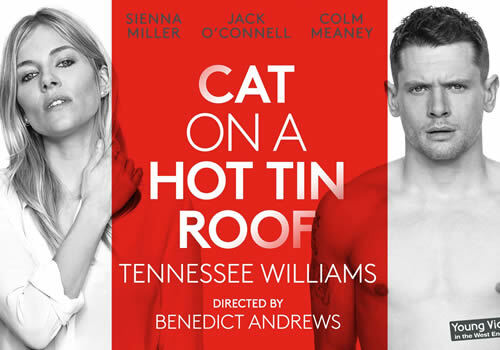 Hollywood actors Sienna Miller and Jack O’Connell lead a new production of Tennessee Williams’ Cat on a Hot Tin Roof, directed by Benedict Andrews. Playing a limited season at the West End’s Apollo Theatre, the Pulitzer Prize-winning play is a brutally truthful, searing look at domestic life. The truth hurts. Set on a scorching night in Mississippi, a Southern family gather at Big Daddy’s cotton plantation to celebrate his birthday. When a secret is revealed, the core of the family quickly begins to break down. As Maggie “the cat” attempts to rekindle her romance with husband and ex-sportsman Brick, in hope of securing a child, lies begin to reach boiling point. With concerns growing over their inheritance of the family estate, Maggie’s desperation for a child reaches an explosive climax in this destructive domestic drama. Cat on a Hot Tin Roof is one of Williams’ most popular plays, with further regularly performed works including The Glass Menagerie, A Streetcar Named Desire and Sweet Bird of Youth. Sienna Miller stars as Maggie, with previous West End credits including As You Like It at Wyndham’s Theatre and Flare Path at the Theatre Royal Haymarket, alongside Jack O’Connell as Brick. O’Connell rose to fame in hit E4 series Skins, winning the 2015 BAFTA Rising Star Award for 71 and Unbroken. Further casting includes Colm Meaney (The Journey) as Big Daddy, Lisa Palfry as Big Mama, Hayley Squires as Mae, Brian Gleeson as Gooper, Richard Hansel as Doctor and Michael J Shannon as Reverend. Benedict Andrews returns to the stage to direct the production, following success with his acclaimed revival of A Streetcar Named Desire. Cat on a Hot Tin Roof features design by Magda Willi, costume design by Alice Babidge and lighting design by Jon Clark. Cat on a Hot Tin Roof was last seen in the West End in 2009, a Broadway transfer starring James Earl Jones and Adrian Lester at the Novello Theatre. Previously, the production ran at the Lyric Theatre in 2001. Opening at the Apollo Theatre, Cat on a Hot Tin Roof begins previews on July 13th and plays until October 7th 2017, with an official opening on July 25th 2017. Cat on a Hot Tin Roof is recommended for those aged 15 and up.